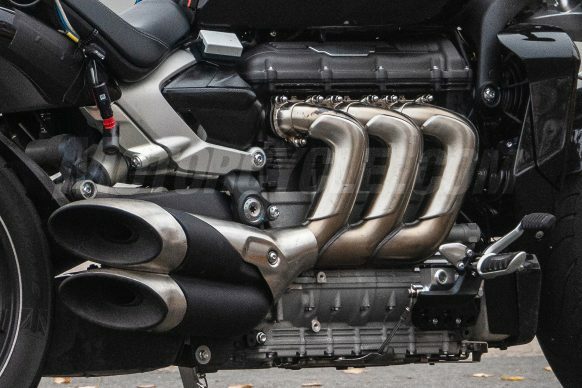 After we told you about the concept illustration a few weeks ago, now we have the spy shots of the new Triumph Rocket being tested. This confirms the fact that the new Rocket is indeed in the pipeline and might see the light of day quite soon. 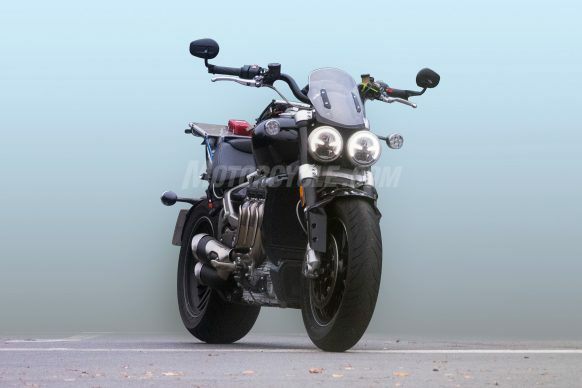 The old Rocket was discontinued because of Euro-IV but instead of a revision to meet the norms, Triumph has decided to go all the way and build a new bike to replace the outgoing model. The new motorcycle boasts of a host of premium features and changes over the outgoing model but one thing that still remains in the signature massive inline triple. But the engine might have undergone some changes as well. The old Rocket III had a 2.3L inline triple that made 145 Bhp and 220 Nm of torque. We suspect that the displacement might have been bumped up to around 2.5L and the power produced might very well be in excess of 180 Bhp. Now, taming this motorcycle can be difficult and therefore, we expect it to come with a full suite of modern electronics including lean sensitive traction control, cornering ABS, rider modes and a quick-shifter plus the usual creature comforts such as heated grips, cruise control, fly-screen and LED lighting. Also, it might very well sport the full color TFT dash from the Scrambler 1200, so it’s likely it will have the same Google maps and GoPro integration. As it is known, the new Rocket seemingly does not have a real frame. Instead the headstock appears to bolt to the front of the engine, while the sub-frame attaches straight to the back of it. Up front the Rocket has huge fully adjustable USD forks that hold a huge front tyre and a set of Brembo Monobloc calipers. At the back the shaft drive remains albeit on a single sided swingarm held up by a giant monoshock. We guess it is quite ready to take on the Diavel now which we think was the intention from the get go. bharatheshk, Mahesh Kumar and RE "H" like this. 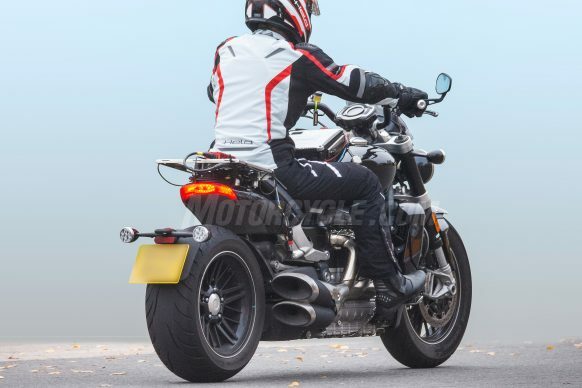 [QUOTE=NewsReaper;1364353][U][B][URL="https://www.xbhp.com/talkies/news/41292-new-triumph-rocket-iii-may-achieve-lift-off-2019-a.html"]After we told you Somehow to me ,the headlights don't seem to be big enough or mean looking compared to the rest of the bike and to the Diavel. However, I think Triumph must think about a Tomahawk like bike, if they can make one practically. That 4 wheeler kind of concept defintiely can be tried on an alternative version of Rocket 3, a lesser "cruiser" version... maybe we call it Rocket 4? The Luxury bike's market deserves such a bike, which can be ridden like a bike, but requires no stand of any kind. Plus, the bragging rights! Yamaha did make a trike on a similar concept at the front at least, but it was a trike. 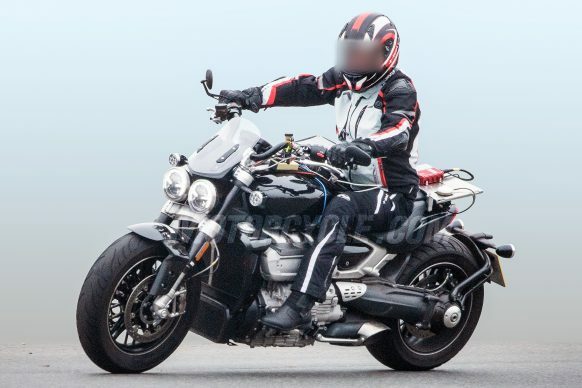 The new Triumph Rocket III may achieve lift off in 2019! A Triumph Rocket III based Cafe Racer! Triumph launches LE Rocket X, India to get 15 units out of 500.
bullet modified to triumph ROCKET!!! !